Disclaimer: I have NO affiliation with Wixey; I am just a happy customer. When it comes to Customer Service, little things count. And Barry Wixey Development makes things right! 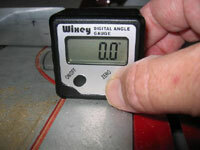 To make a long story short: My Wixey Digital Angle Gauge went crazy – I was unable to make my Wixey gauge read any angle reproducibly. As a result, I had to start making adjustments to my table saw blade using old techniques, such as bevel gauges, squares, etc. I hated doing this, since I became reliant on the Digital Angle Gauge for critical blade adjustments. Fast-forward one week: I contacted Barry Wixey via e-mail. I told Barry I was having trouble with the gauge. He told me he would replace it, upon receipt of my old one. I sent my old one (around one year old by now), he received it, and two days later I had my new one. Please note that Barry must be contacted via e-mail, as phone calls keep him away from making and testing these fine little instruments; his web site does not even have a contact phone number. Send him an e-mail if you have any problems with your gauge. He will make things well, if the unit is still within its warranty period – no fuss at all. THAT is what superb Customer Service is all about! Thank you for a great product, Barry. But, above all, thanks for your superb Customer Service! I had heard about how good Wixey’s Customer Service was – but to experience it first-hand is wonderful!